Monstrous Matters: New in Light City: Welcome to The Assembly! I'm very happy to announce that there's a new Light City product available for download on your favorite OneBookShelf storefront: The Assembly! 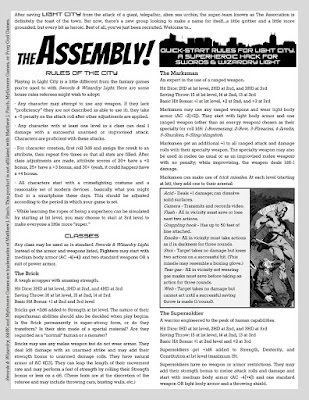 The Assembly is a two-page add-on for Swords & Wizardry Light that stays true to the original SWL philosophy of encouraging quick-start play by covering just a few levels. 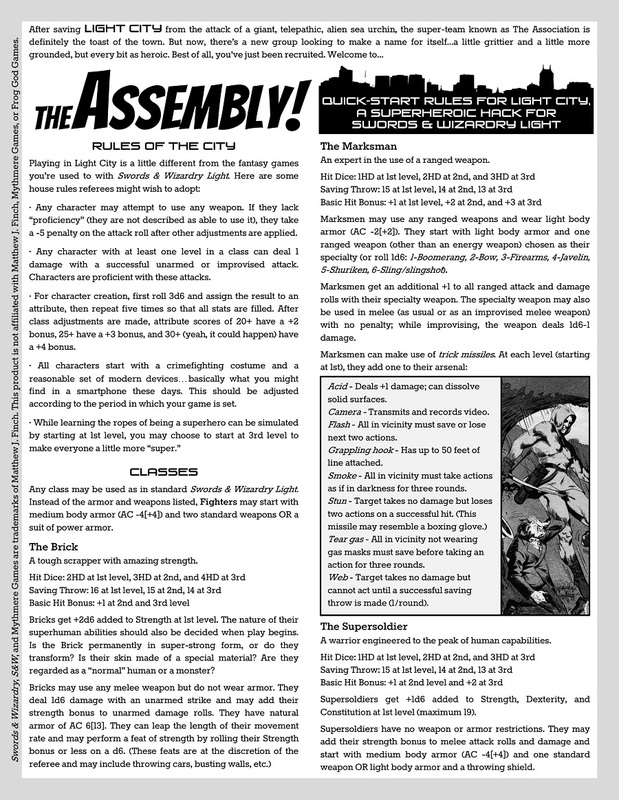 You can print it out and tuck it inside your SWL folder to make it just about as easy to get a supers game going as a traditional fantasy outing. This new release includes work by +Justin Isaac as well as my usual rambling. It covers three new classes (The Brick, The Marksman, and The Supersoldier), some modern and comic booky weapons, and a bunch of baddies that fit the four-color theme. You can even use it to play some of your favorite cinematic heroes, should you be so inclined. And of course, it's free! I hope you'll check it out and let me know what you think if you get a chance! The pdf looks great and I'm letting everyone know they should check it out. Thanks a ton for the signal boost and especially for making it possible for this to get made!